We're excited to introduce a new bit of kit to the Hak5 arsenal – the Plunder Bug! 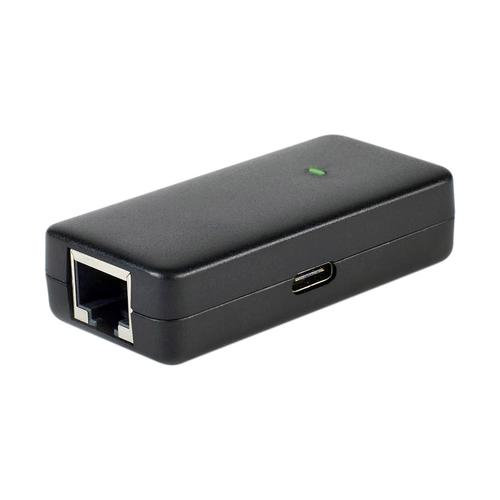 It's a smart LAN Tap with a new take on Packet Sniffing! This is a bit of kit I've been wanting for myself for quite a long time, as I've never been satisfied with the traditional RJ45 Ethernet-based LAN Taps, and if we were going to make one we'd make it special with the ability to act as not just a tap but a mini-switch and a USB Ethernet adapter all in one. It's sweet and simple with the convenience of USB-C and a very small form-factor while sporting some features you won't find in your typical LAN Taps – like the integrated USB Ethernet adapter (yay, no more mess of cables and dongles! ), the ability to make passive captures or active scans (acting sort of like an unmanaged switch), and a companion Android root app that makes it possible to capture packets right from your phone! As for the tech, we've packed in a 10/100 Base-T Fast Ethernet switch with the mirrored traffic heading to the integrated USB Ethernet adapter (ASIX AX88772C chipset) and the whole thing is powered over USB-C with a very low draw around 200-300 mA. INB4 it's compatible with gigabit links in that it'll drop 'em to 100 Mbit. Looking at the tools scripts, there does not appear to currently be capacity to use more than one on a system at a time. The script looks for the first instance of '00:13:37' and manages rules for that interface. Is this something you plan to enhance in the future? Making a guess about the design, we have a 100Mbps switch ASIC with one port connected to each RJ45 and one to the AX887722C, configured to mirror traffic to the port for the AX887722C. So the question is, what are the capabilities of that ASIC aside from span, and can we get at the management plane via the AX887722C? How does this behave with dot1q tagged networks? Is any tag automatically applied to traffic coming in from the AX887722C, is tagged traffic send by the USB connected host sent (flooded?) unmodified, and is this configurable? Does the tap learn MACs and forward like a switch, or flood all traffic sent by the USB host? Assuming it learns, what is the MAC table capacity? Don't really see the difference between this and the PS (apart from USB Type C upgrade from Micro) but it sounds cool. Cringing a bit at the old hardware though..The USB Type C is a good upgrade, +1 for that but I'll have to give a -1 as well because of the lack of gigabit and no PoE (although I completely understand that PoE increases the overall size and footprint of the device). Good job on releasing a new device though. Glad to see some more hardware coming out to work with. I have the PacketSquirrel and i love getting Hak5 Products and tools and supporting them. This does look very cool, and I like that is has a USB-C, but I feel it does the same thing as my packet squirrel. Am I wrong or this or? I don't think this device contains a MIPS SOC like the packet squirrel, so there is nowhere for the C2 software to run. This is just a network tap and a USB ethernet adapter. I've really enjoyed using the LAN Turtle! I used it with various techniques (i.e. Wifi to ethernet adapters) and found it great use in all areas of my work. I'm not going to throw away my LAN Turtle (may I'll find a need down the road), but this plunder bug is going to get a lot of usage. I just received my Plunder Bug and loving it! Thanks guys for making my job easier. - It looks like it’s plug ‘n play for Windows but for Mac I had to install the drivers from the ASIX website. - The original cable is too long, when using it with the Plunder Bug Android app it keeps connecting/disconnecting. If I use a shorter cable like Darren in his movie it does work. - The Plunder Bug Android app doesn’t see any packets which is strange because when I open a terminal on my phone I can see the Plunder Bug is connected and it even shows packets (RX/TX) so why doesn’t the app see them? it’s good for an air-gap system and network that doesn’t have any primary security solution like port security!!! I'm sure this is a nube question, but just bought an Android phone to be able to use it with the Plunder Bug. When I launch the app, it pops up a message "Let's get started" You'll need to allow root permission to start capturing packets..." however when I click "OK" the popup comes right back so I'm not able to move forward. Is there somewhere in android I need to make this change before I start the app? I guess I was expecting that the pop up would do it for me once I agreed, but i'm new to the android world. Much thanks. I'm sure this﻿ is a nube question, but just bought an Android phone to be able to use it with the Plunder Bug. When I launch the app, it pops up a message "Let's get started" You'll need to allow root permission to start capturing packets..." however when I click "OK" the popup comes right back so I'm not able to move forward. Is there somewhere in android I need to make this change before I start the app? I guess I was expecting that the pop up would do it for me once I agreed, but i'm new to the android world. Much thanks. You need root your Android device. Not all devices can be rooted. What's the make/model of the phone?